Issue: File downloaded from website after popup happened, I'm guessing. File: something.htm from a site with xyz as the extension. 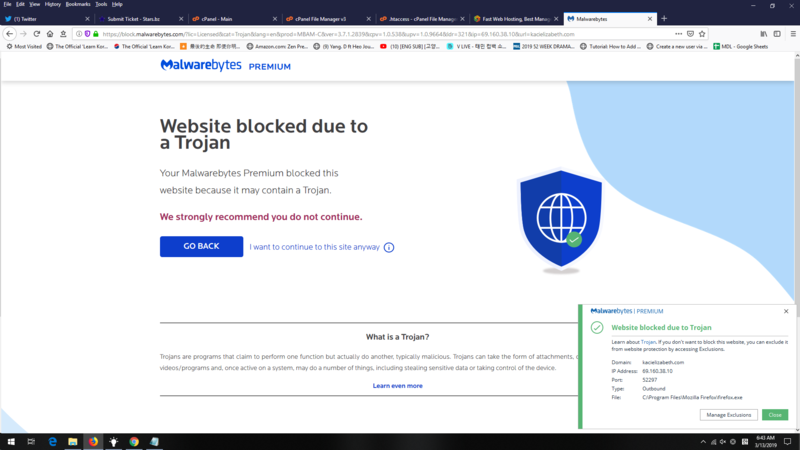 Malwarebytes blocked me from visiting the site. Happened: February 23rd at 10am. Additional: My space saver came on, but I am not convinced they are related as I cleaned a few things out of my computer and now have more space. What I Have Done: Ran scan with premium malwarebytes (threat) and adwcleaner. Turned off automatic downloads in Chrome. Results: Found no issues or viruses/etc. Additional Question: Do you know how to delete temporary files safely without losing any of my actual files? As I think that might be where all of the space is being taken up at. I have attached the threat scan txt and the farbar scan FRST and Addition txt. Thank you for any help! I am very grateful! Turn System Restore ON for Drives in Windows 10 - Immediately. Hi! Thank you so much for helping me! I turned on system restore for both hard-drives on my computer. I chose 11gb for one and 18gb for the other, is this an okay option or should I make it higher/lower? I have ran the fixlist and attached the fixlog! The fixlist cleared up a good amount of space! And I haven't really noticed any problems so far. My display had a little glitch for a second but I think it's because the system was still booting up. I was mostly just worried I might have a virus, do you think I did? For your peace of mind run this scan. Please download Sophos Virus Removal Tool and save it to your computer's Desktop. Right-click the icon and select Run as administrator. Select 'I accept the terms in the license agreement', then click Next twice. Click the Install button and wait until the installation is complete. Click the Finish button. The tool created a shortcut icon on the Desktop of your computer. Now, double-click the Sophos Virus Removal Tool shortcut icon to run the tool. Disconnect from the Internet or physically unplug your Internet cable connection. Close all open programs, scheduling/updating tasks and background processes that might activate during the scan including the screensaver. Temporarily disable your anti-virus and real-time anti-spyware protection. Please post the contents of the log in your next reply and note any errors encountered. Thank you so much! Nothing came up on the scan, thank you! Topic has been reopened per request. 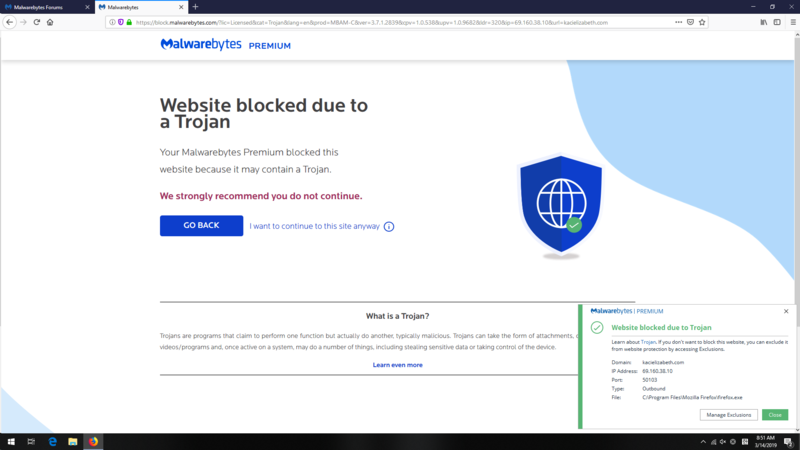 When I visit a site that I currently run, it says I cannot visit due to a trojan? But myself and my host has checked and so far there's nothing. I'm thinking malwarebytes might be flagging it, I want to say as a false positive, unless it's a plugin. But everyone says they aren't getting any warnings and that the site is secure with the green lock. The url is in the attached screen capture. I have also attached the files from a quickscan, FRST (and addition), ADWCleaner. And I ran a scan with Sophos Virus Removal Tool and it said my computer was clean. I have visited the site in both firefox and chrome. The IP in the malwarebytes popup warning at the bottom is the server IP that the site is currently hosted on. I'm not syncing on any devices. I have reset my firefox and it still persists. Do you think it's a false positive on the site? If it is - is there any way to have it removed from malwarebytes' list as an infected site? I have ran a scan on the site itself, inside of the cpanel (since I run it), and there's no viruses. I suggest you open a service ticket in the Support forum. An expert will look into this.